Select all that uses a CONCAVE lens. Lenses: Anytime you look through binoculars, a camera, or eyeglasses, you are using convex lenses to bend light. A lens is a curved piece of glass or other transparent material that is used to refract light. A lens forms an image by refracting light rays that pass through it. Like mirrors, lenses can have different shapes. Concave Lenses: A concave lens is thinner in the center than at the edges. When light rays traveling pass through a concave lens, they bend away from the optical axis and never meet, because parallel light rays passing through the lens never meet. Light enters the eye through the transparent front surface called the cornea (kawr nee uh). After passing through the cornea, light enters the pupil. The pupil is an opening through which light enters the inside of the eye. After entering the pupil, the light passes through the lens. The lens is a convex lens that refracts light to form an image on the lining of your eyeball. When the cornea and the lens refract light, an upsidedown image is formed on the retina. Concave lenses are used to correct nearsightedness. 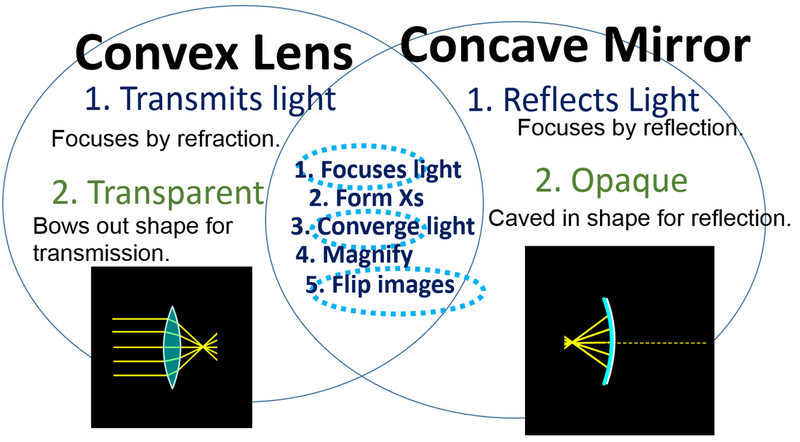 Convex lenses are used to correct farsightedness. A nearsighted person can see nearby things clearly, but objects at a distance are blurred. The eyeball is too long, so the lens focuses the image in front of the retina. To correct this, a concave lens in front of the eye spreads out light rays before they enter the eye. As a result, the image forms on the retina. A farsighted person can see distant objects clearly, but nearby objects appear blurry. The eyeball is too short, so the image that falls on the retina is out of focus. A convex lens corrects this by bending light rays toward each other before they enter the eye. A telescope helps you see objects that are far away. But another type of optical instrument, a microscope, helps you see objects that are nearby. Three common types of optical instruments are telescopes, microscopes, and cameras. Refracting telescopes and reflecting telescopes: A refracting telescope consists of two convex lenses, one at each end of a tube. The larger lens is called the objective. The lens close to your eye is called the eyepiece. A reflecting telescope uses a large concave mirror to gather light. The mirror collects light from distant objects and focuses the rays. To look at small, nearby objects, you would use a microscope which uses two convex lenses to magnify an object, or specimen. The specimen is placed near the objective.